Dream World Carmen Miranda doll 11" tall, is unmarked, had a hang tag that identified the dolls name and will probably have staple marks on the dolls back from the attached clothing. Dream World dolls were manufactured in the USA from the late 1930s to the early 1950s. Dolls are all composition, most common are the 11" tall size, less common are 14" tall, with jointed bodies; neck, shoulders and hips, have a glued on mohair wig, painted side glancing blue eyes with painted upper lashes and a red painted closed mouth and both sizes are unmarked. Dolls have clothing stapled to the body, came in elaborate formals, dressed in International costumes, as a personality or even dressed for an occupation. Thousands of these small inexpensive dolls were sold to decorate a bedroom shelf and many dolls are found today in all original clothing, as it is stapled on. 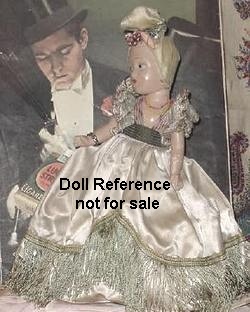 Junel Novelty Company made similar 11" dolls with painted side glancing eyes, dolls are also unmarked, clothing is sewn, not stapled to the bodies and Madame Alexander made side glancing painted eye 11" Wendy Ann dolls, which are marked with their name and do not have staple marks on the dolls body.